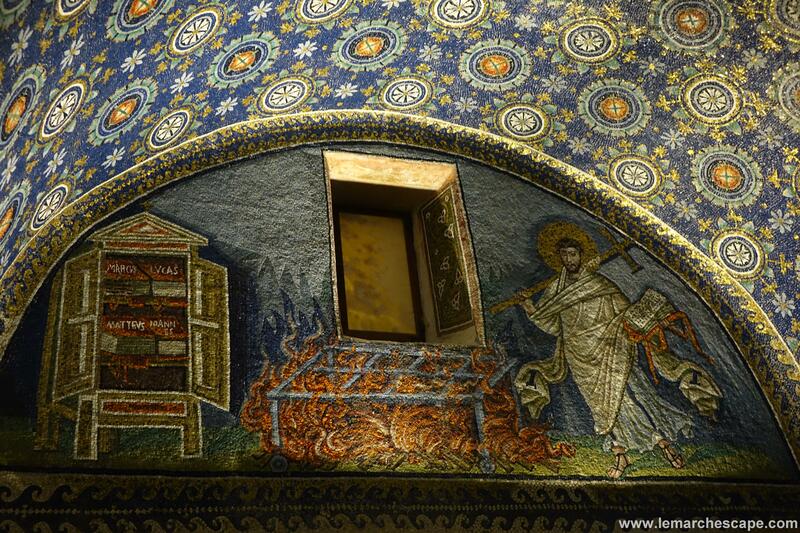 The Nine Circles of Hell, Sightseeing in Ravenna and Photo Expeditions! How’s everyone? I’ve had a very good, though largely unproductive, few days! I shall tell you what I’m supposed to be doing – I’m supposed to be editing my book. And yet it seems I’ve spent most of my time doing more interesting/inspiring things instead. I’ve only managed two editing days in the last fortnight. I must, must, must finish!!! The weekend before last I went to see “Dante’s Inferno” in the caves in Camerano where I used to live (to be clear, I used to live in Camerano, not the caves!). It was probably one of the most unusual plays I’ve seen – rather than sitting in one place it was a sort of group walking tour of the 9 “circles” of hell. As a quick summary, Dante and Virgil (of Roman poetry fame), take a tour of hell which is divided into 9 circles with increasing levels of torment in line with the increasing seriousness of the sins committed. In each larger cave (they’re all connected by small candlelit passageways), there were two or three actors that would recount what was going on in that specific circle of hell. Anyway, it was very good, though in a very difficult form of Italian (passato remoto – it’s not very common and more often used in the written form!) so I had to fill in the gaps with trusty Wikipedia after the performance. 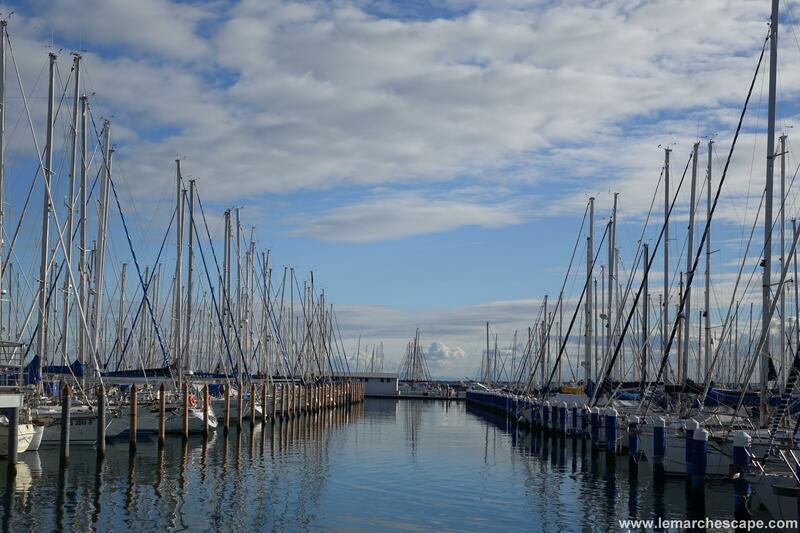 I was also invited to Ravenna last weekend by my lovely neighbour to stay with her just as lovely family. I think it’s probably my most ‘full-on’ Italian language experience to date. I think I have a sort of weekly brain usage quota and as a result, I feel pretty brain dead – I’m unable to string more than a couple of words together now. 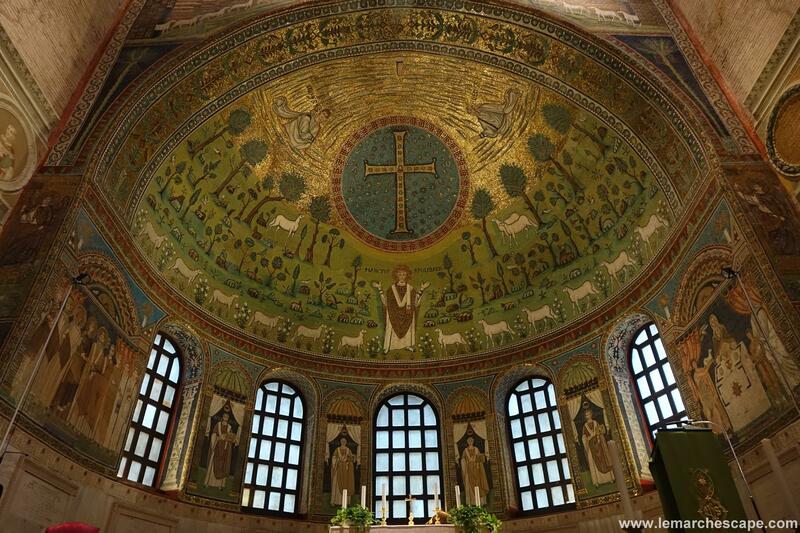 Ravenna is absolutely spectacular though. I didn’t know anything about it before I went but it’s in Emigia-Romagna, the region north of Le Marche (the region where I am), and on the coast. It’s well-known because it has an extraordinary number of mosaics, some of the oldest in the world and most of them are in the churches. Ravenna is basically built upon a massive lagoon. If they hadn’t filled it all in over the years and sucked out all the water, it would have been like Venice. As it is they’ve had to keep building Ravenna up because it seems the entire city is suffering from subsidence! As a result, when you go around the old historic sites, you kind of walk down to them. It’s got a fascinating history; all recounted by my neighbour, her niece and niece’s partner. This sort of knowledge and patriotism about the area you live in and its history and artwork is something I love about Italy. Alas I have a terrible “in one ear, out the other” tendency for all things of historic importance, which is un-reflective of my level of interest so apologies for my lack of educational information on this blog but have a look here if you want to look into it! If you visit Ravenna yourself it’s well worth buying a sightseeing ticket which will get you into the main sights (tombs and churches mainly!) for just under 10 euros. Mosaic somewhere in Ravenna – I should have made a note! 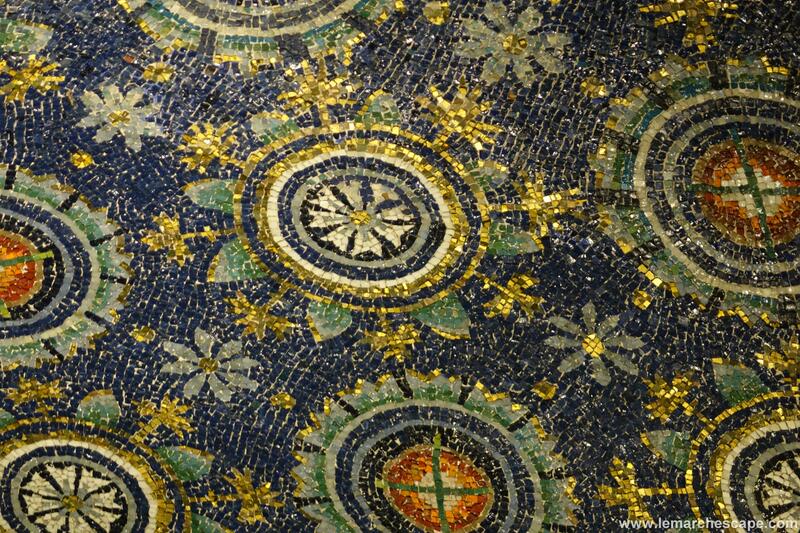 Perhaps we can call it an interactive, “guess where this mosaic is?” sort of competition. The winner gets credited in the caption. Now…. this is in the tomb of Galla Placidea. I was thinking about having my tomb decorated similarly. There is solid gold in all of these mosaics. SOLID GOLD! 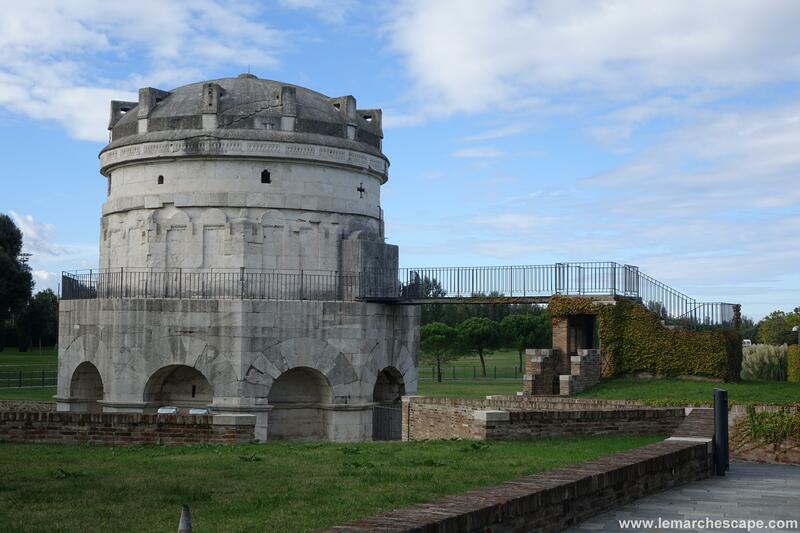 This is the Mausoleum of Theoderic. He was a big deal in Ravenna. He was worried about getting captured so there’s rumours of a secret tunnel that goes from one of the churches in Ravenna to this mausoleum (they liked to build their mausoleum’s whilst they were still alive – I guess if you want to make sure something is done right, do it yourself!) and at that point, it was right on the seafront so he could have made a quick get away. 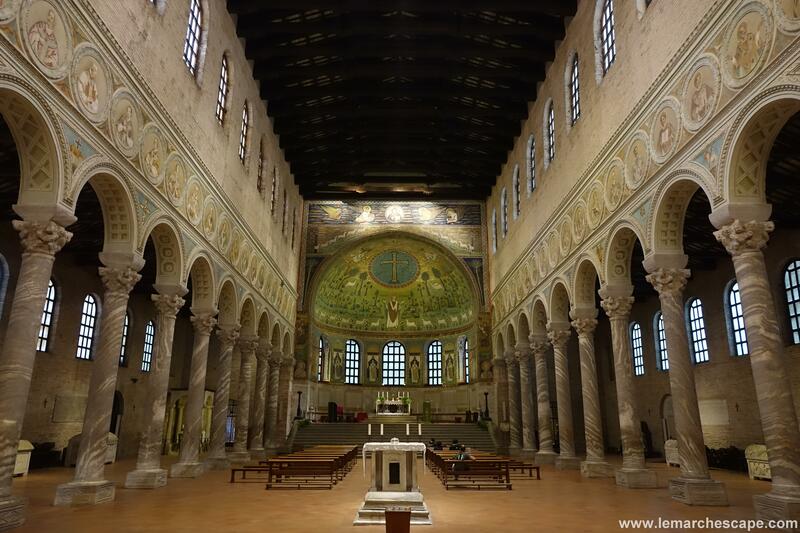 It’s very difficult to imagine how Ravenna must have looked a few hundred years back! And, you guessed it, more mosaics – this mosaic covered a massive area in a large church… all telling the history of Jesus. 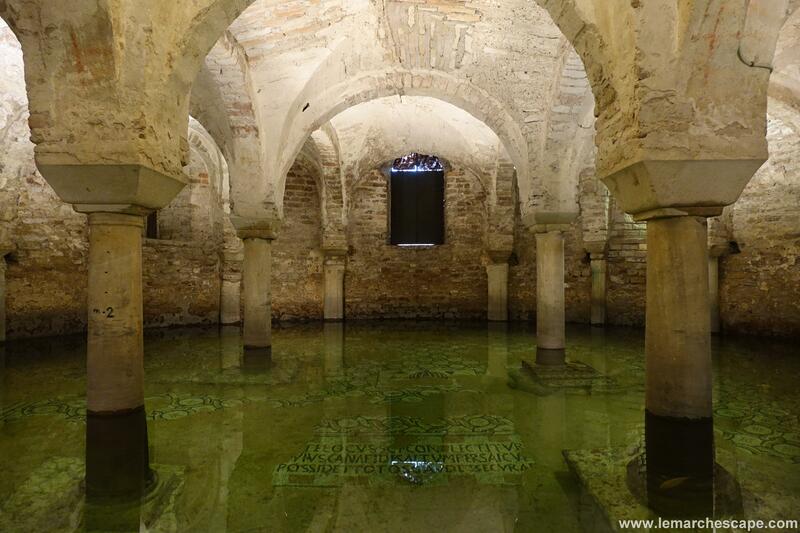 And this is in the crypt of another church. 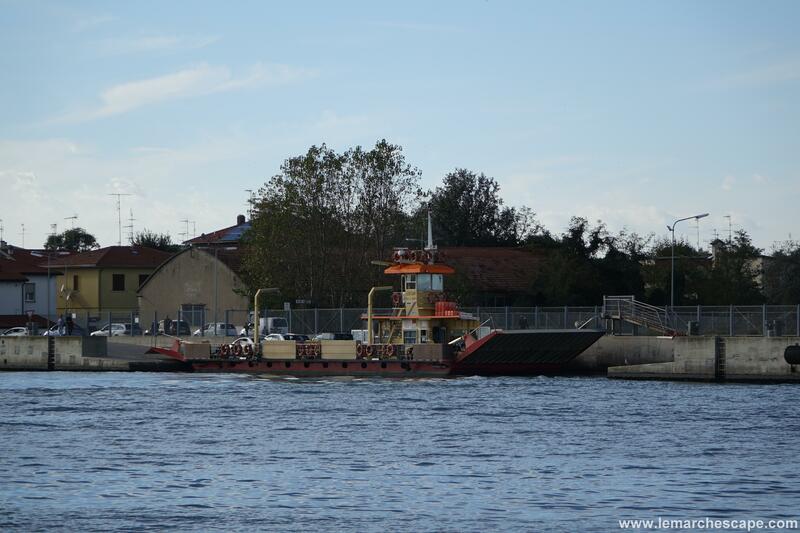 I said how Ravenna was built on a lagoon – well you can see here how it’s been quite difficult to keep the water out!!! There’s actually fish swimming around in it!!! It makes me feel better about the damp problem in my house at least. And this church is still in Ravenna but further out. It was my favourite – nice setting (you have to pay 5 euros to go in. 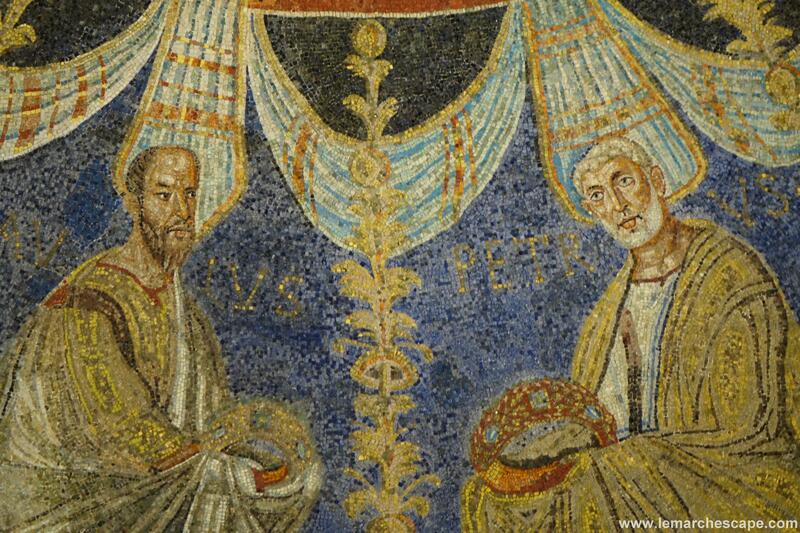 The churches in Ravenna must make a fortune). The mosaic around the altar was amazing. 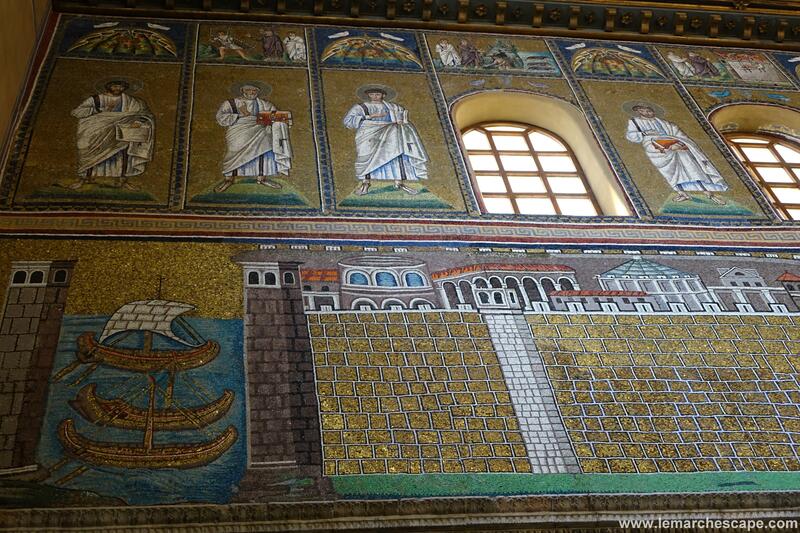 Still with solid gold – the churches in Ravenna it seems are wealthy! This is a close up of above the altar. 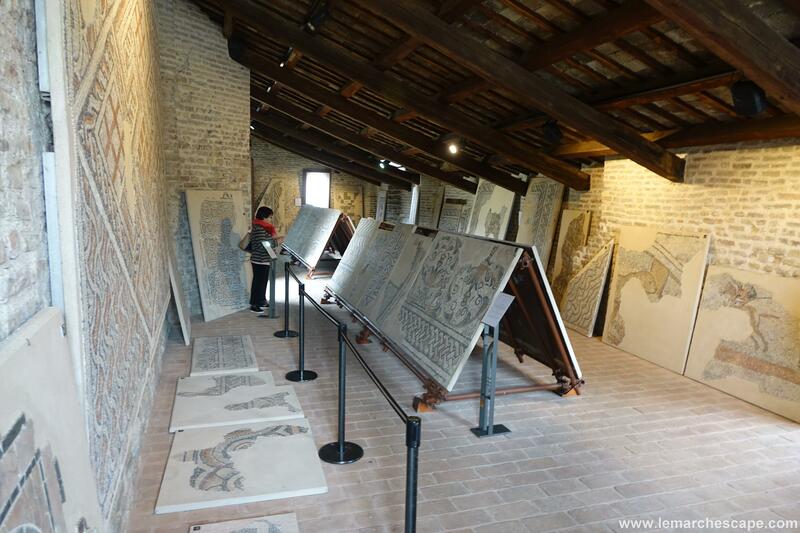 All these mosaics must have taken decades!!!! 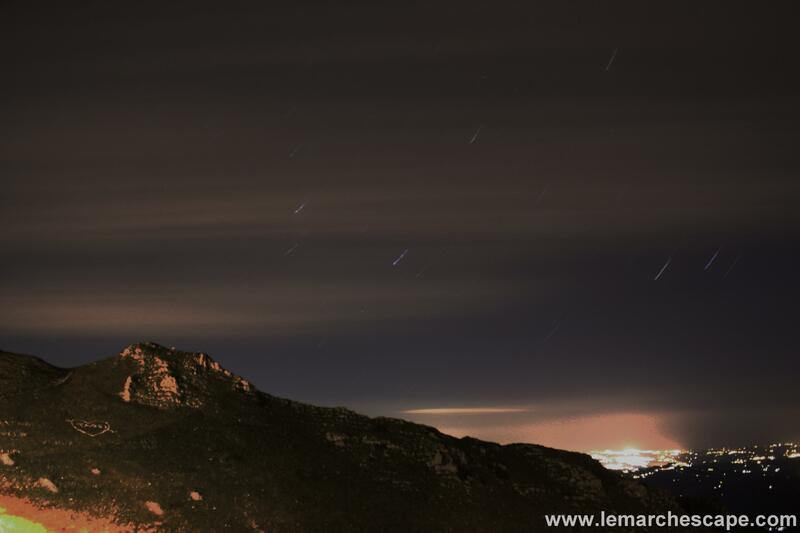 On a different note I was up in the mountains taking pictures of the stars last week. 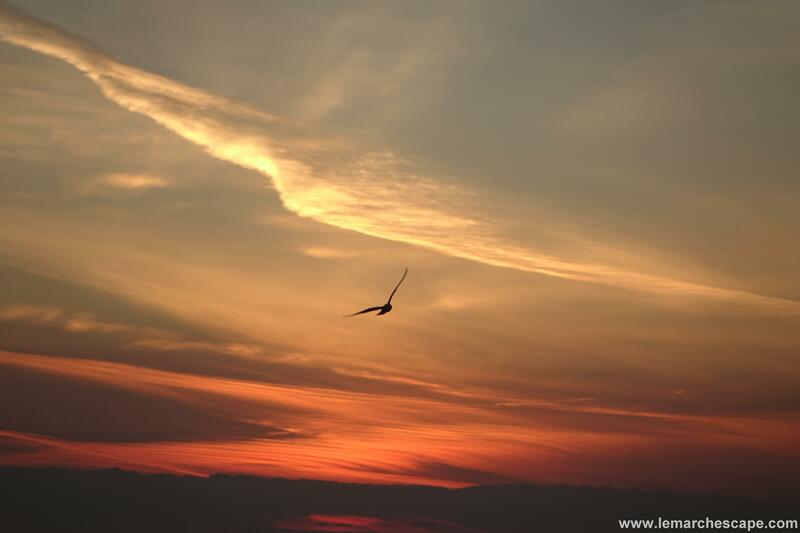 It’s a lovely idea in theory – it’s absolutely stunning up there at night. But there is NOBODY around and the problem with star pictures is that you have to leave your camera out taking photos for half an hour (because it’s so dark you need to have a long exposure so that you can get enough light in). So I ventured into the pitch blackness, set up the camera, waited in the car and then started worrying that there might be an axe-murderer on the loose. Next time I’m going to take a photography buddy with me! 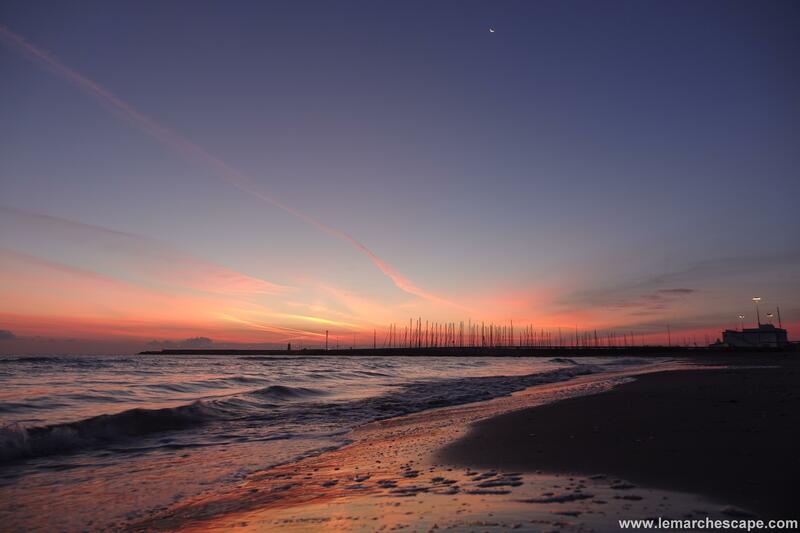 I also got up at the crack of dawn the other week to take photos at the beach in Civitanova. It feels like I’m always awake at the crack of dawn but I usually stay in bed willing myself to go back to sleep. But the sunrise was so lovely it inspired me to actually get up early again (for all of about half an hour). Yesterday I was very cultured and went to a Schubert and Chopin piano concert in Macerata. Very good indeed. Finally, it’s chestnut season!!!! I’ve been having a great time harvesting stuff this month. My friend who has a house nearby has been visiting for the last week or so and we found a great spot a couple of days ago for chestnut picking. So, inspired by none other than Frank Sinatra, I have been roasting my chestnuts on my (non)open fire. They’re EXCELLENT!!!! I still have to perfect the timings but the recipe largely goes: 1. Score the chestnuts, 2. Put them in a tinfoil little parcel with a spoonful of water, 3. Chuck it in the stufa/wood burner for 20 minutes, 4. Peel and eat them. I think Mr Sinatra would have been impressed. Mmmmmmmm. I hope you’re all having an excellent week. Buona giornata da Sarnano! Lovely! We went to Ravenna from Bologna a few years ago. Yes, it’s lovely. I think they visited it on Italy Unpacked as well.